What a lovely month it has been, except for the incredibly hot temperatures we have had in Chicago! As a child, I lived without air conditioning. For the past few weeks, every night as I crawl into bed, one of the last things I say is, "thank you Lord for air conditioning!" Complaining aside, I have so enjoyed the push that Becky of Trial Balloons gave me. Had it not been for her, I would not have ended up with all the new pieces in my wardrobe. Now, this is just the best!!! You may remember the piece I painted and then had made into fabric. Well, I sent a piece to Becky and look at the AMAZING top she made! Oh my, I am beyond flattered. The panel that I sent to her was unfinished, which I felt a bit bad about, as I thought she might just turn the edges and use it in a bread basket. What she did with it is a masterpiece. 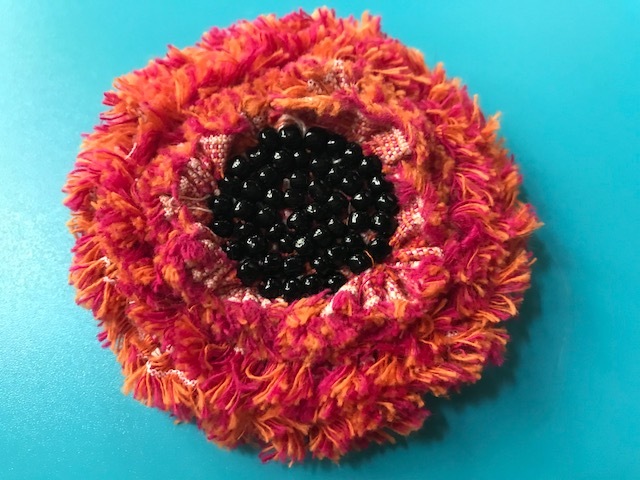 Be sure to pop over to her blog and see the back, as well as all the other lovely pieces that she made...and the poor woman has had pneumonia! You can see all her work HERE. When Becky asked if I would like to participate in a month of woven tees, she said that she would put a Pinterest page together for us. The top below is one that she found and pinned to the page. I thought it was rather nice, so I used it as my inspiration for my tee, which is really a dress. To be honest, I wear more dresses than anything else in the summer, so a new, pop over the head dress is always up my alley. Once again, I used the free raglan tee pattern from fabric-store.com You can find the pattern HERE. Rather than dividing the sleeve, I decided to just start my design line from the underarm intersection. I did do a funnel neckline, which I really like. Super easy to do BTW. If you look closely, you can see that I tapered the side seams just a bit, but not so much so that I can't get the dress over my head. I also added a pocket. 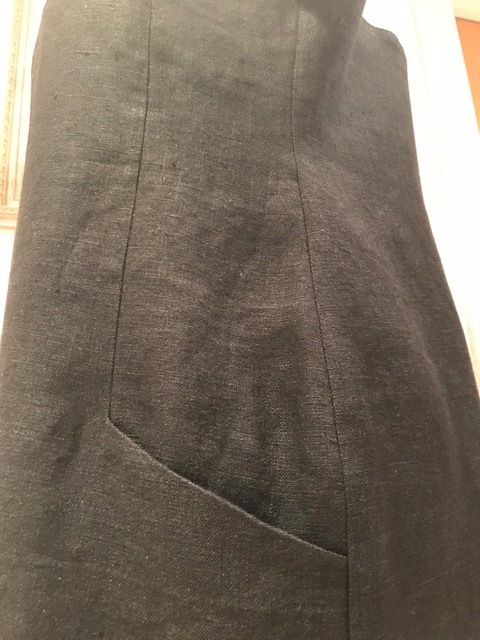 I think you can see the lines of the pocket better in the picture below. 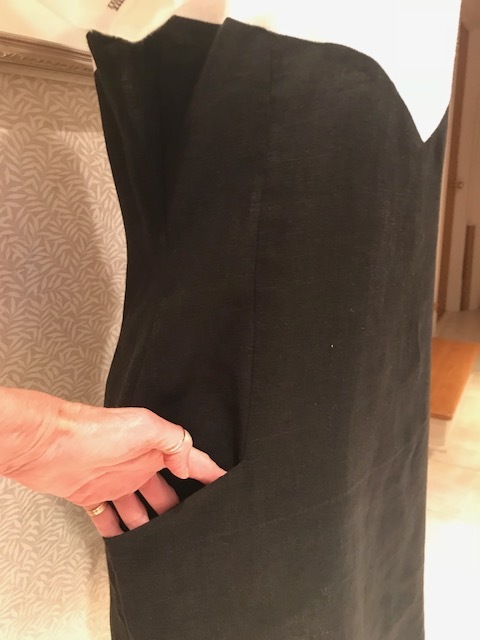 The seam line begins at the style line of the bodice and comes down to the pocket, but not all the way to the hem of the dress. It makes the pocket area a little trickier to sew, but not that much. 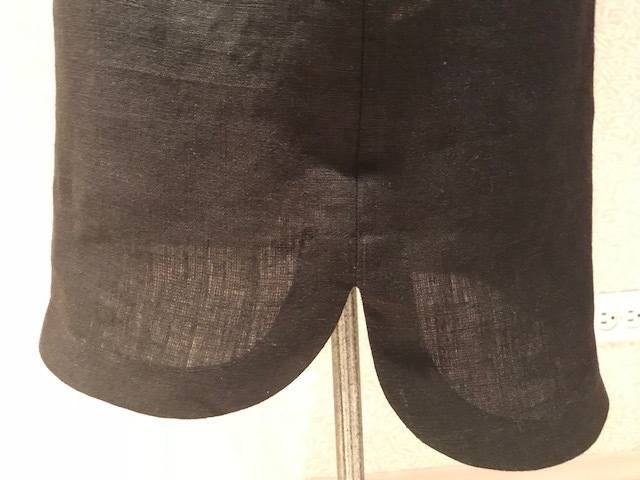 The reason that I did not want the seam down to the hemline was because of the shirttail hem that I wanted to do. 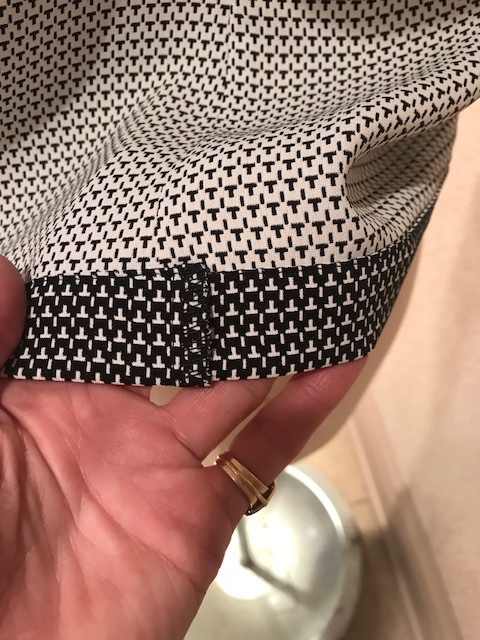 Having the seam line to the hem wouldn't have made that much of a difference, but I just didn't want the extra bulk in the hem. 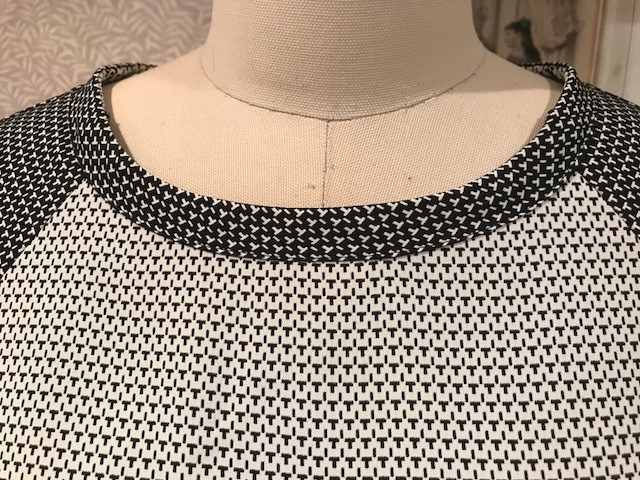 If by chance you would like a tutorial on how to make the funnel neckline, or how to draft the pocket, just let me know. They are both fun to do, and you can see that they can easily be added to a basic pattern such as this. 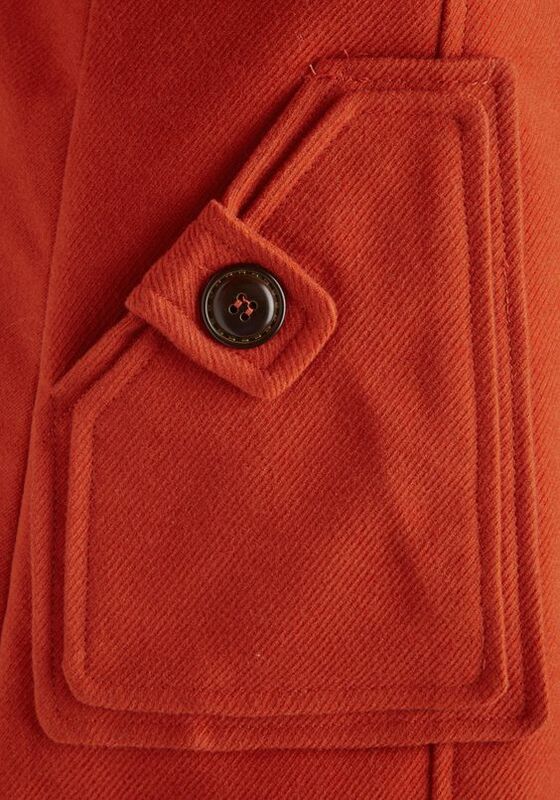 Monday Morning Inspiration/The Selvedge Edge/I Need Your Help!!! Last week, I received a note from Ruth. She said that she hates to waste fabric, especially the selvedge edge as sometimes it's more interesting than the actual fabric. So true. She asked if I could do a post on creative uses. 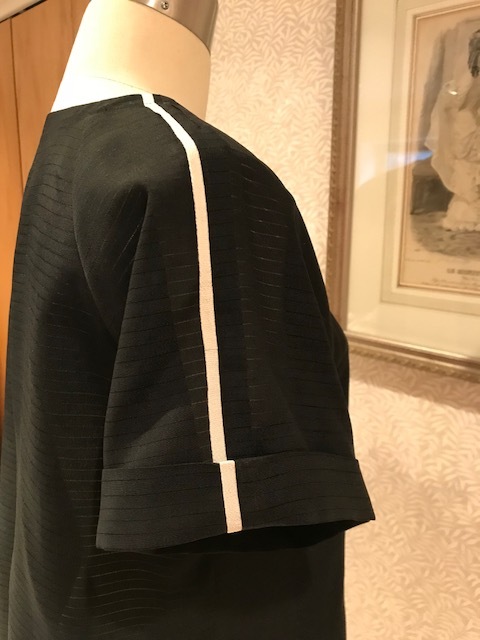 I know that I have seen some of you use the selvedge edge to create trim for a Chanel inspired jacket. But, what more have you done or seen? I have looked, and looked, and looked. 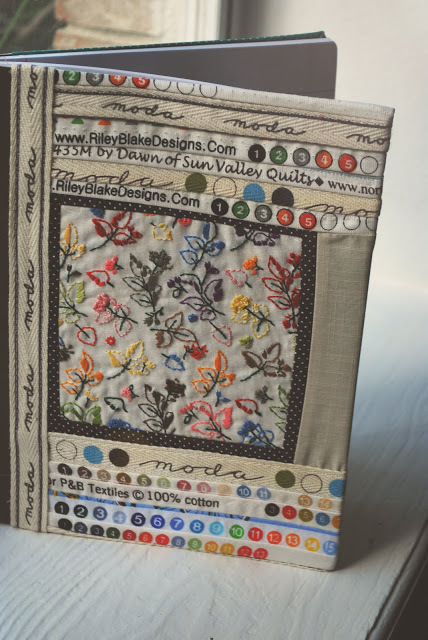 All that I was able to come up with were projects using the selvedge edge of quilting fabrics. 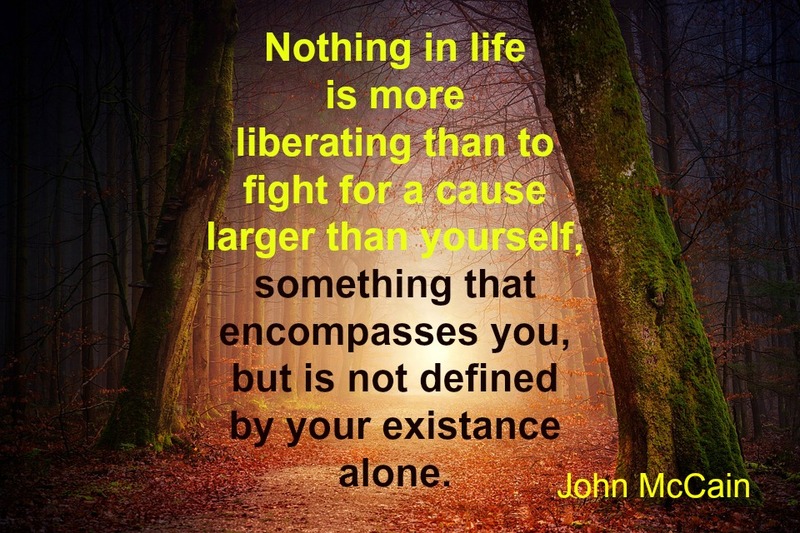 While a lovely idea, we all know that there's so much more out there. So, if you have a link that you don't mind sharing, either leave a comment on this post, or email me at sewbussted@yahoo.com. 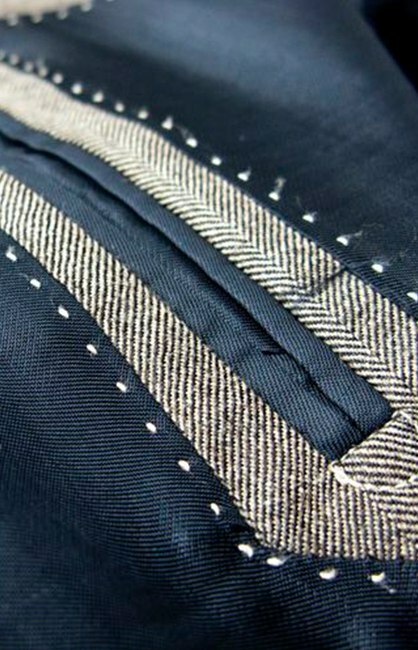 I would love to give recognition to anyone who has, or is doing something fun and interesting with selvedge edges. One piece that I did was the flower below. The selvedge edge of the fabric was so pretty, so I just gathered it up and made a pin. The pieces featured below are all made using selvedges from quilting cottons. 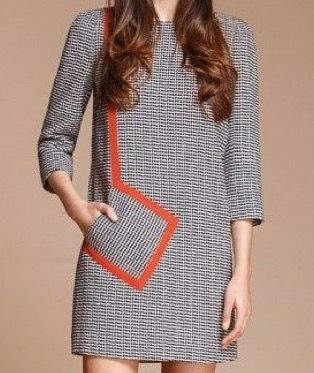 This dress is from Ric-Rac Sews. Talk about a labor of love! 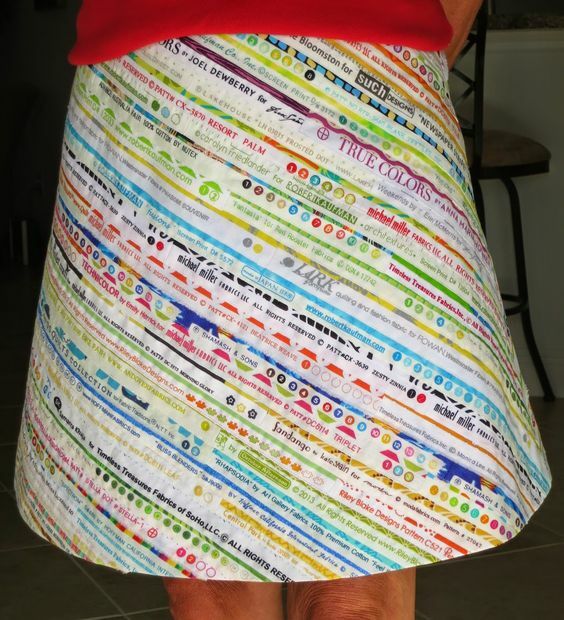 This sweet little skirt is from Flourishing Palms, and she called it the Name Dropper Skirt. Cute! 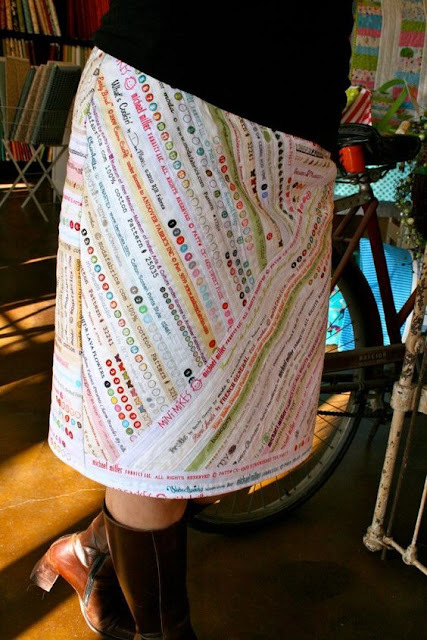 I couldn't find the person who made this skirt, but I love the play on stripes. I love making journal covers and I thought this one from Write It Down was especially sweet. In my searching, I managed to learn something new, at least to me. There is a denim that is called selvedge edge denim. The picture is below. It comes with this lovely and colorful edge finish. I need to find some of this!!! I hope that someone can help me, and Ruth out. 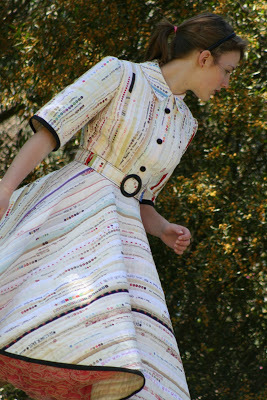 I would LOVE to see some wonderful things that have been done with the selvedge edge of wools, linens, etc. Thanks so much, and have a wonderful week! 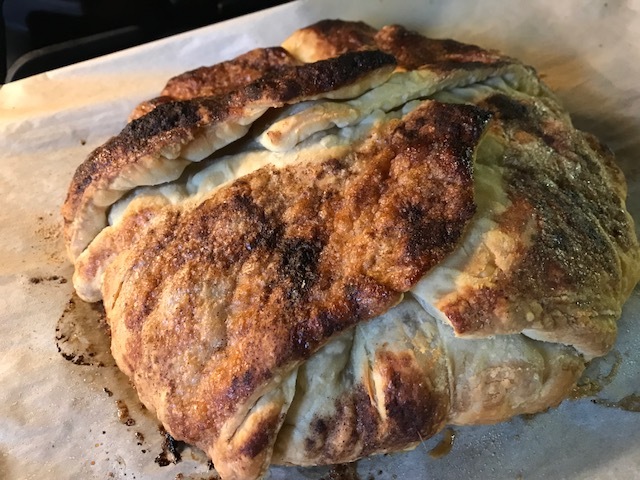 I always enjoy sharing recipes that are easy, and yet delicious. 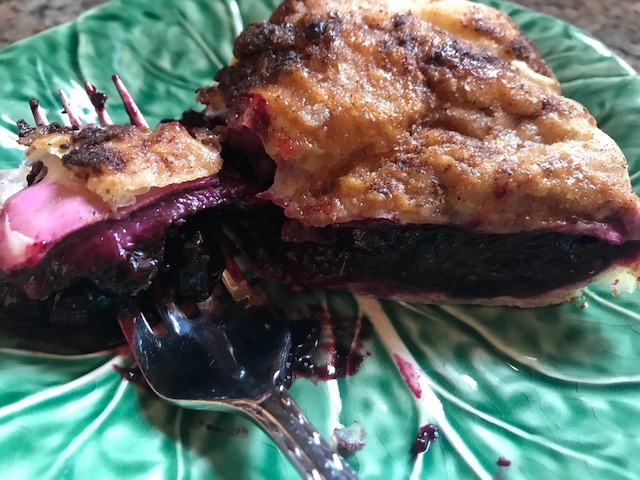 While I love a traditional pie, time can be of the essence at times, and I need a delightful dessert that just won't take as much time as putting a pie crust together. The recipe I'm sharing today works well with apples and berries alike. I call it a Rustic Tart. 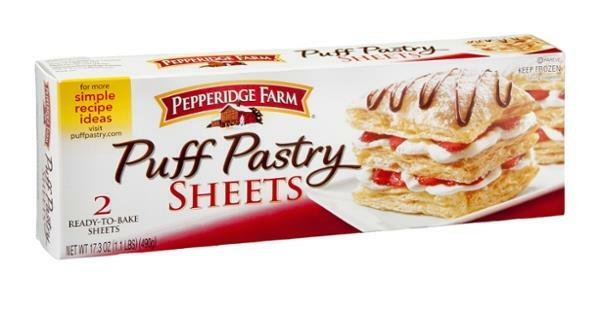 I always keep a package of Puff Pastry in my freezer. You can find these in your grocer's freezer section. The package contains 2 sheets, so take 1 out for a tart, and save the other until the next time! I begin with my fruit. For this tart, I used 2 apples, and 2 pears, skin removed and sliced . 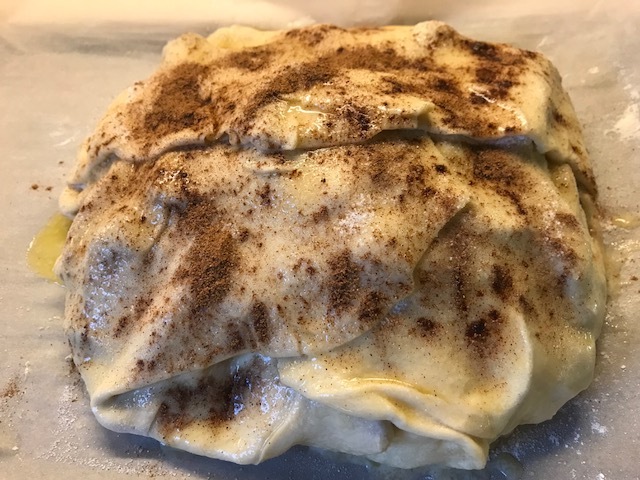 I don't like a really sweet pie, so I use about 3/4 cup of sugar, 2 teaspoons of cinnamon, and 1/3 cup of flour to coat the fruit. 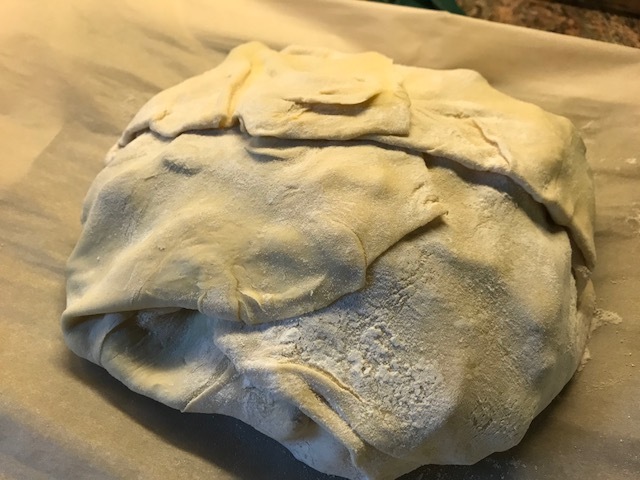 Once the fruit is ready, I take 1 sheet of puff pastry and roll it out on a floured surface to about the size of a large cookie sheet. I like to sprinkle the pastry with a thin layer of minute tapioca. This will help to thicken up the fruit juice as the tart cooks. The fruit is then piled high in the center. Dot the top of the fruit with approximately 1 tablespoon of butter. Pull the ends of the pastry over the fruit to close the tart. Melt 1 tablespoon of butter and brush over pastry. Sprinkle the buttered pastry with sugar and cinnamon. Then bake in a preheated 400 degree oven for 30 to 40 minutes, or until golden brown. As the tart bakes. the smell in your kitchen will be so welcoming! I forgot to get a picture of the finished apple and pear tart. But, I had made a strawberry and blueberry tart using the same directions. As you can see, this is a very versatile recipe. Sprinkle surface with flour. Roll out puffed pastry sheet to size of a large cookie sheet. 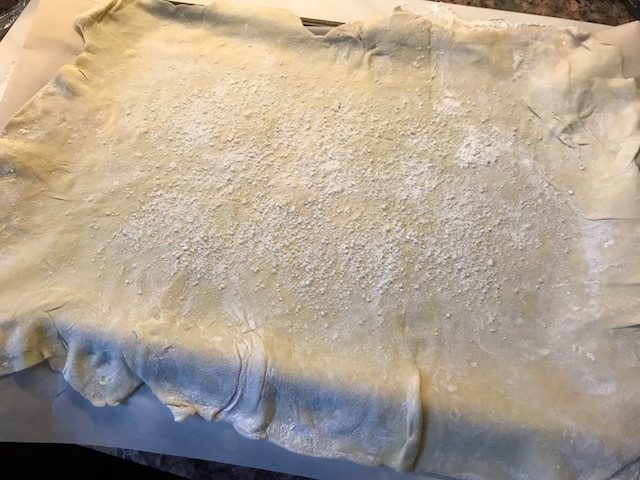 Line baking sheet with baking paper and place rolled out pastry sheet on top. Sprinkle center of sheet with minute tapioca. Pile prepared fruit in center of sheet. Dot fruit with 1 tablespoon of butter. 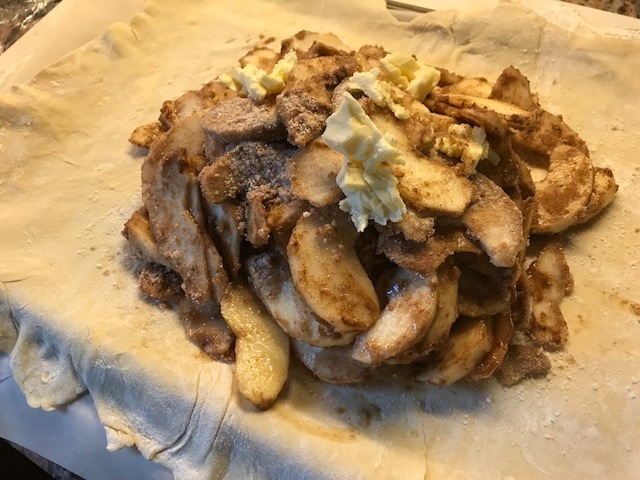 Fold pastry over fruit to cover. 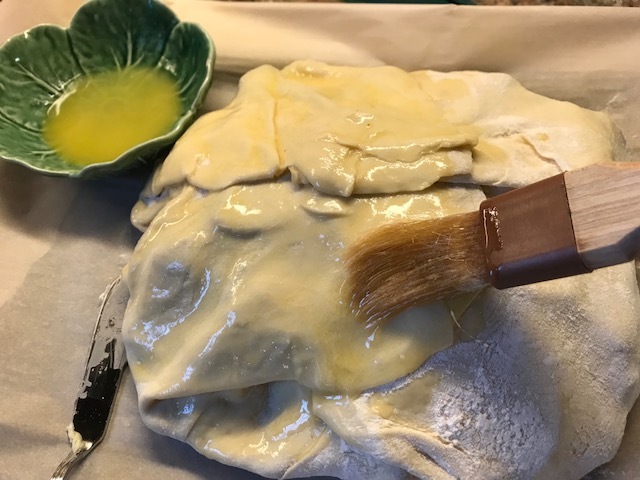 Melt 1 tablespoon of butter and brush over pastry crust. Sprinkle buttered pastry with sugar and cinnamon. Place tart in preheated oven and bake for 30 to 40 minutes, or until crust is golden brown. Allow to cool, slice and enjoy! 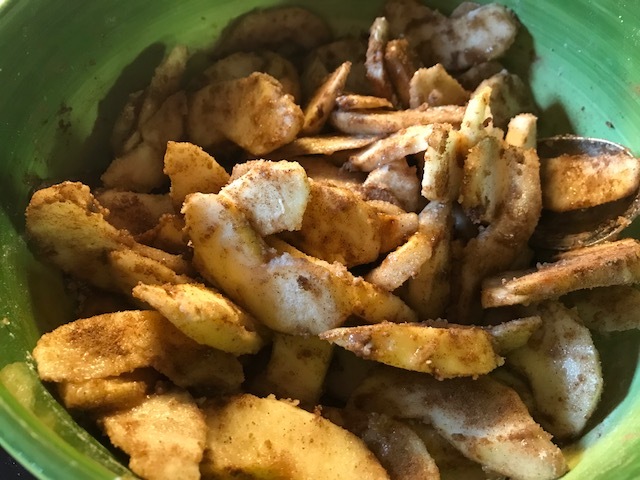 This is a recipe that my husband absolutely loves. If you give it a try, I hope your family will love it too! At long last, I have a new edition of Sewbussted Reads is up on Youtube. The books are not for everyone, but I decided to go ahead and do the review, as each of the books have meant so much to me. And, if to me, then maybe there is someone out there for whom the books will be just what they need. In this video, I talk about a wonderful book, Tattoos On the Heart by Gregory Boyle. The second book is one that I have had in my personal library for such a long time, A Shepherd Looks at Psalms 23. Both are beautifully written, and full of inspiration. 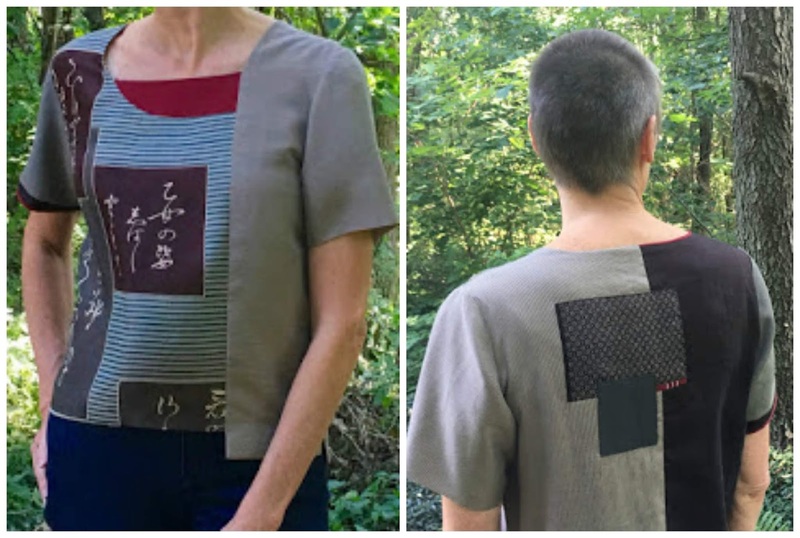 You may notice that I am wearing the tee I made for this week's Month of Woven Tees :) I'm so grateful that Becky invited me to do this challenge. I'm getting so many wonderful new pieces in my wardrobe! I'll tell the story in full at another time, but what a couple of days I have had. It even included me having to run and hide between houses at 2:30 in the morning. When we last touched base on Monday, I had said that Mr. Berkley was doing so well, I spoke too soon. He had gotten me up due to a sick stomach, and it was while I was out with him that we encountered a car that was doing some strange things, and which made me feel the need to run and hide between houses. But hey, I'm here to tell the story. A good ending is always a good thing! For the month of August, Becky of Trial Balloons and I are doing a month of woven tees. I decided to just use the same pattern for each of my tees. 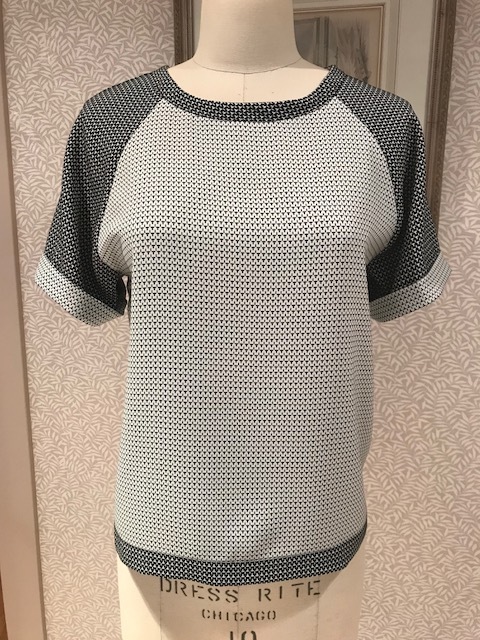 Since I have been using the free raglan tee from fabric-store.com, this week's challenge of using a raglan tee pattern was a cinch. 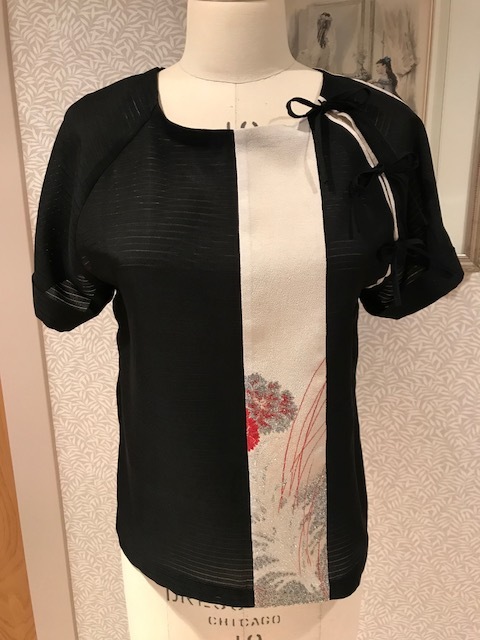 Becky did a layered tee that is absolutely smashing. You can find it HERE. 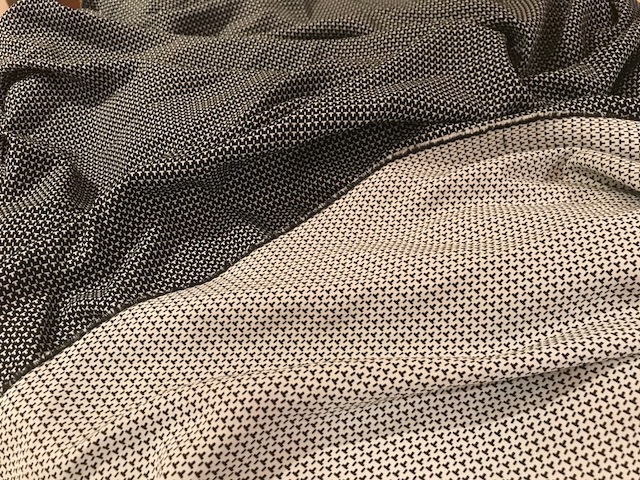 I had this piece of double faced fabric that I have been wanting to use, black on 1 side, white on the other. I must say that I really took the easy way out on this challenge, as I basically just made up the pattern as is. But, a raglan tee offers a nice option for color blocking. So I used the black side of the fabric for the sleeves, and the white side for the body. 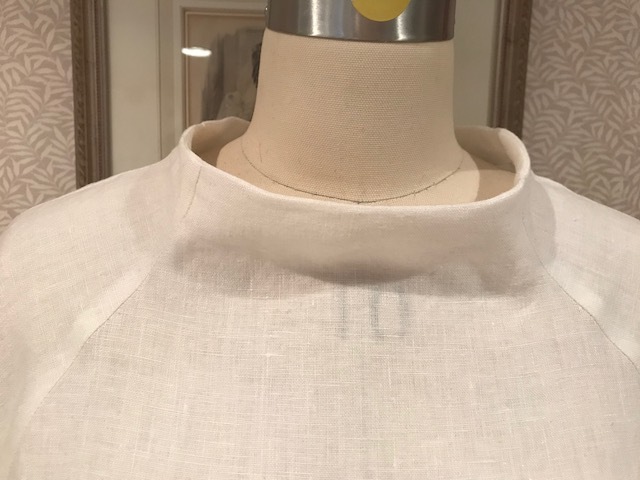 Rather than sew the bias binding to the inside of the neckline, I sewed it to the outside to continue the color blocking aspect. For the sleeve cuff, I rolled the hem to the outside so the opposite side of the fabric would be seen on the cuffs. And I rolled the hem of the top to the front side as well. 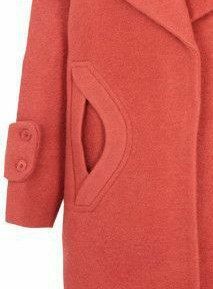 What you see below is the serged edge of the side seam. I could have done a flat-felled seam, but I was fine with the small amount of the serged seam showing. My recipe this week is also very easy. It can be a refreshing afternoon drink, or served as a cocktail. 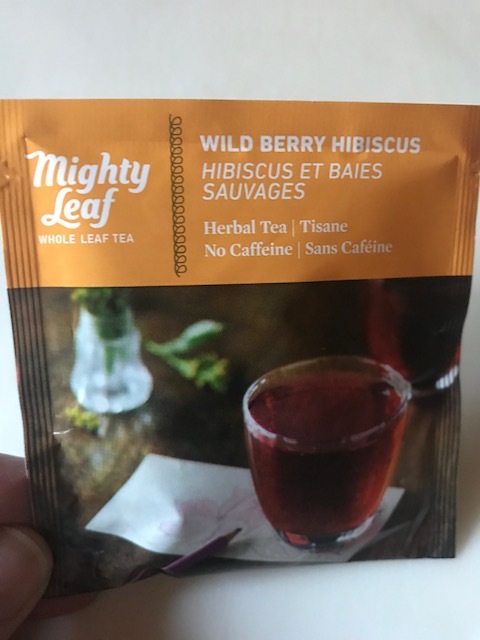 I begin with the Wild Berry Hibiscus tea from Mighty leaf. Any hibiscus or berry tea will be fine. 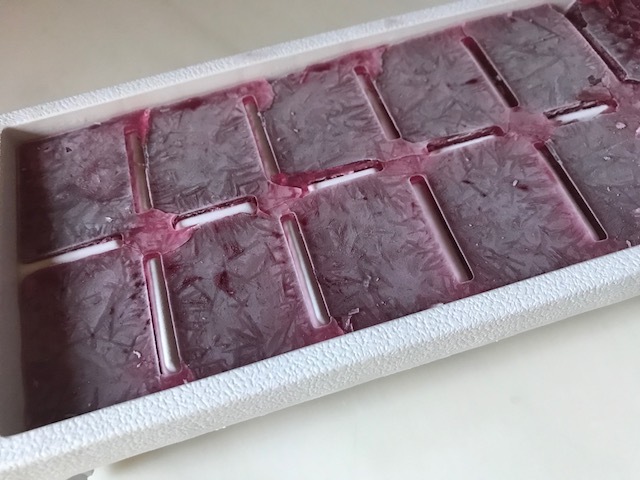 I brew up a pitcher full, and then pour some of the tea into an ice cube tray. 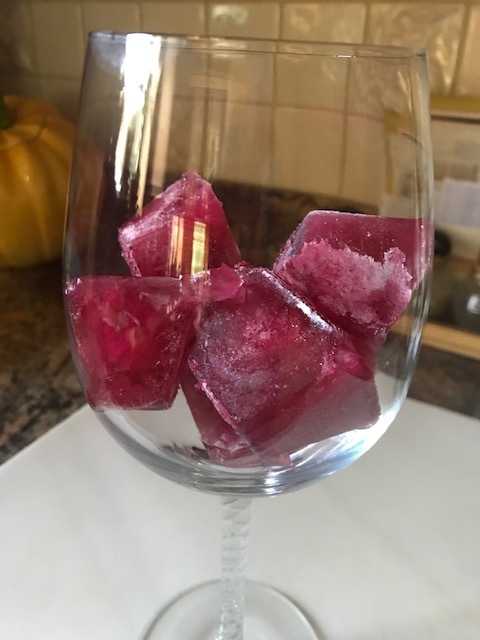 Place frozen ice cubes in a lovely glass. Fill the glass about 1/3 full of the brewed tea. Now, here's where you can take it from an afternoon treat to a cocktail. 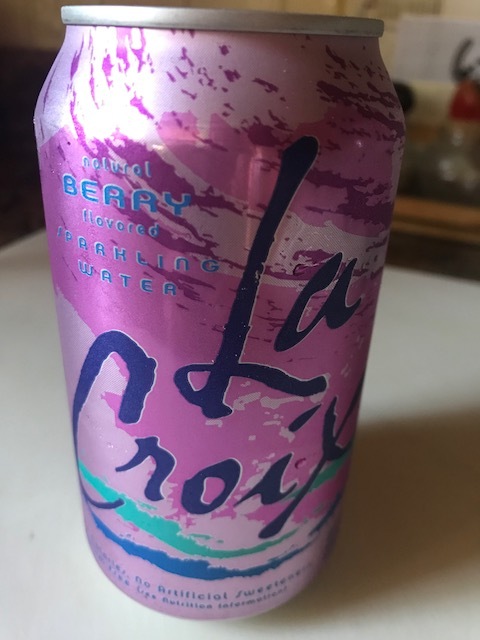 For an afternoon treat, I like La Croix Berry flavored sparkling water. Fill with the glass with the sparkling water, and you have a delicious drink. 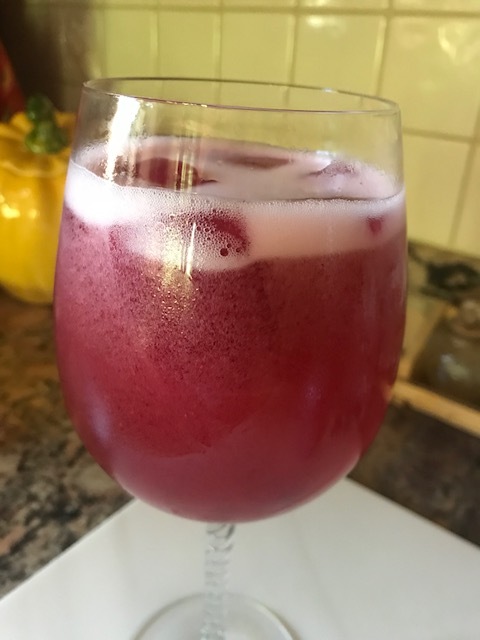 If you would like a cocktail version, just substitute the sparkling water with Prosecco, or your favorite sparkling white wine. 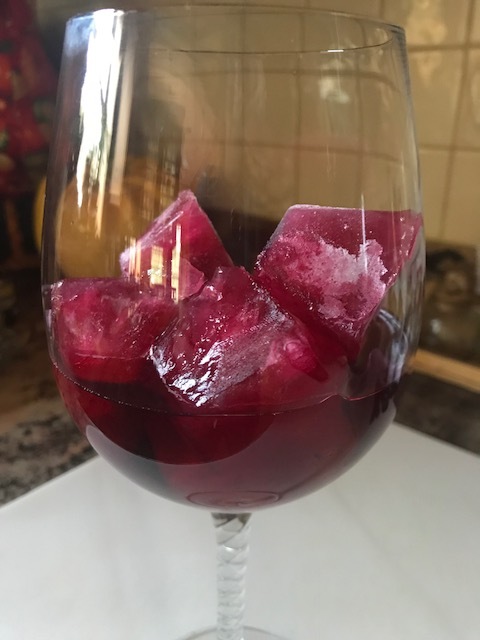 What I love is that when the ice cubes begin to melt, the drink does not get diluted, and the flavor remains delicious from beginning to end! 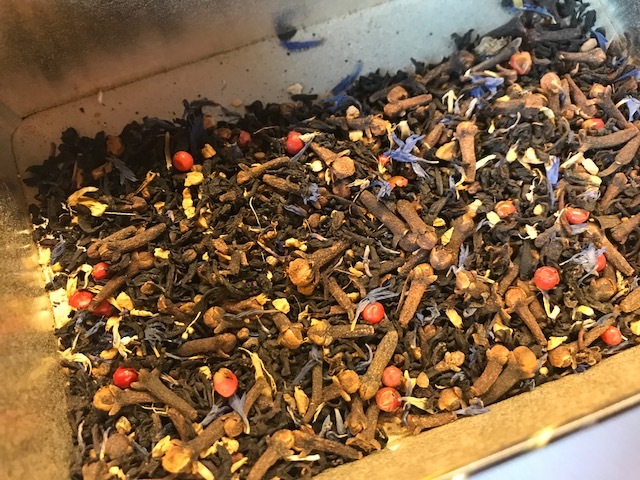 Be sure to check out Becky's recipe for Earl Grey French Macaroons. My mouth is watering!!! Lots of finallys today! Mr. Berkley is finally conehead free. He's happy, I'm happy. He has also finished up all the medication that I had to give him for various reasons, and has gotten a clean bill of health. Makes me VERY happy :) We are having a lovely rain shower here in Chicago. Everything is so very dry. The temperature has finally gotten below 80 million degrees, and the air conditioner has finally been turned off. I'm so grateful for air conditioning, but I love when I can turn it off and enjoy fresh air. We attended a wedding this past weekend. The bride was lovely. It was hard for me to look at her and not remember her as a child. She was visiting with us one weekend when she was maybe 5, my husband was sick. I couldn't find her, came in our room and found her on the bed next to Carl, sitting on her knees, just as happy as she could be, not the least bit intimidated, talking away. I can remember her dad worrying about every aspect of her life, getting her into the right school, the right university, the right guy. The finallys of their lives arrived, she finished #1 from dental school, and she married the right guy. 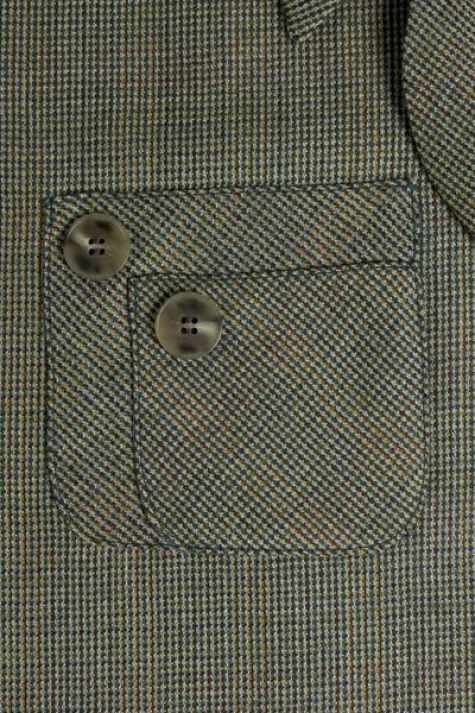 This pocket detail is a tutorial from Threads. You can find the tutorial HERE. This is another version in a different shape. Love the addition of the tab closure. Another fun little pocket. Just a twist on a welt pocket. I couldn't find where this picture came from, but how pretty! This is most likely on the inside of a garment, but it is pretty enough to be a fabulous detail on the outside of the garment. This is a leather garment, but it would work with a woven. Basically gives a double pocket. 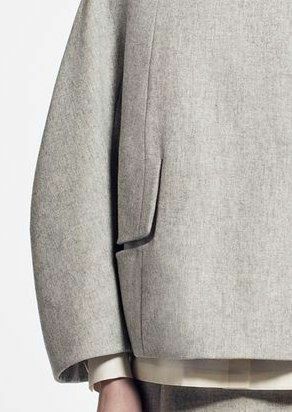 I don't particularly care for the square pocket, but I thought the idea of giving interest from the shoulder down into the pocket was interesting. 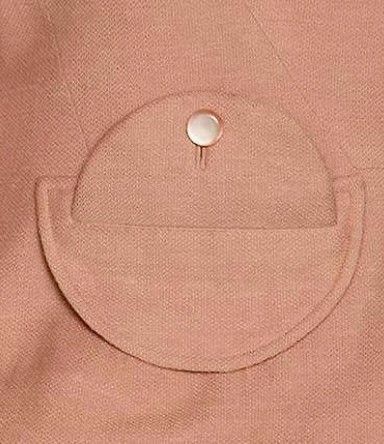 This pocket has me stumped just a bit, but I love it. 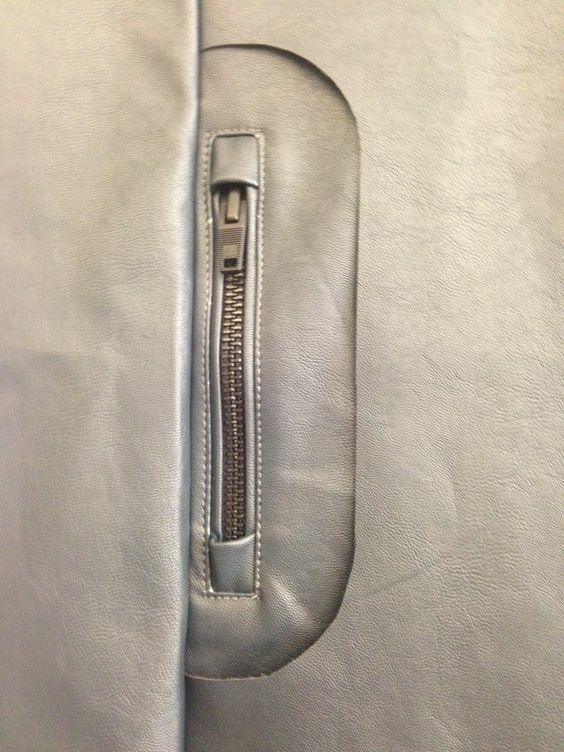 I think the jacket was sewn together, and then the opening for the pocket was done. Beautifully executed. I've thought a bit about finally. 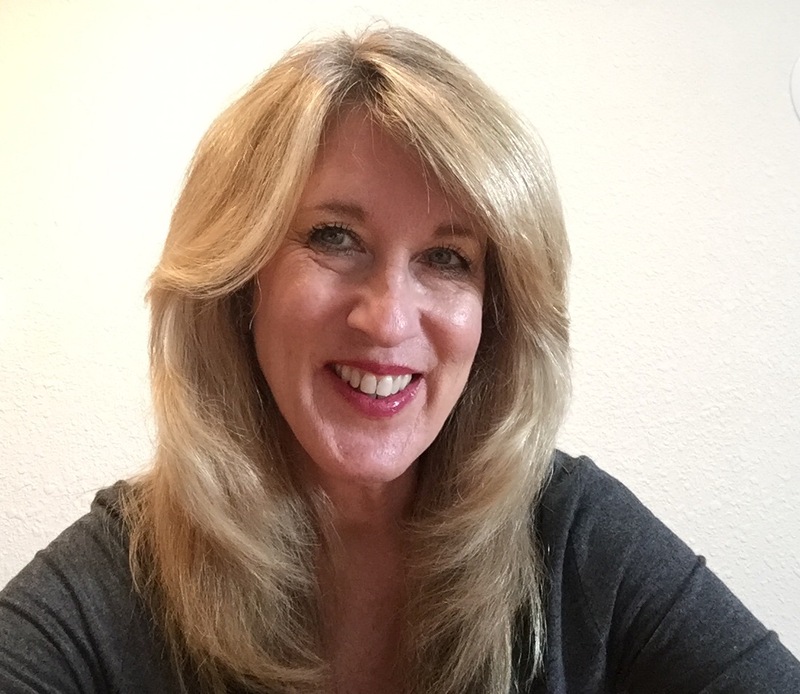 I know I'm guilty of saying, "when this is finally over," or, "when we finally get to this point..." I've received a few text messages from my friend, I can hear the longing in the words, finally came all too fast. 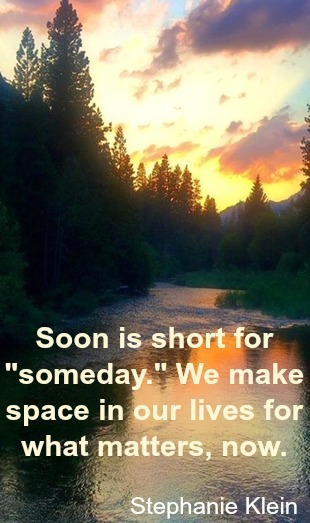 I'm learning, but it has taken almost a lifetime, to just enjoy the moment and not wish for finally. The board for the Haute Couture Club of Chicago met at my house yesterday to plan out our upcoming year, and of course, I could not let them go without lunch! Whenever I entertain, I do my best to try and have items that will satisfy diet restrictions. That of course can be a very tricky thing. In order to try and provide something that everyone could eat, I had the loveliest heirloom tomatoes that I sliced, sprinkled with a little dried oregano, and some sun-dried tomato infused olive oil. I made my favorite fruit salad, mango, peaches, and cantaloupe. 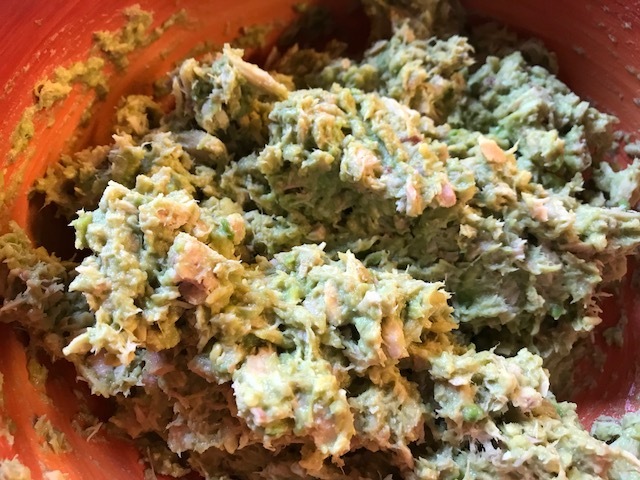 Finally, I made one of my favorite tuna salad recipes. This recipe has no mayonnaise, yogurt, or sour cream, so anyone who may have an egg or dairy issue, I'm in good shape. Well, I'm in good shape as long as they can eat tuna!!! The recipe is super simple. I take 4 avocados and mash them well. 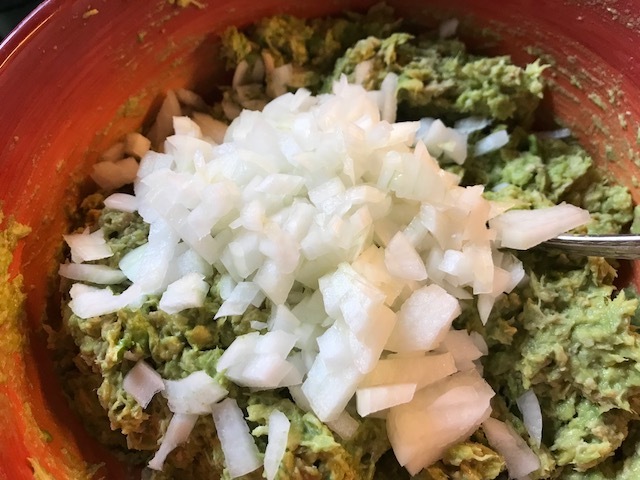 The mashed avocados are then mixed into 4, 4 oz. cans of drained tuna. I always get tuna in water, and I try and get the best quality tuna. A small onion is chopped and added to the mixture. 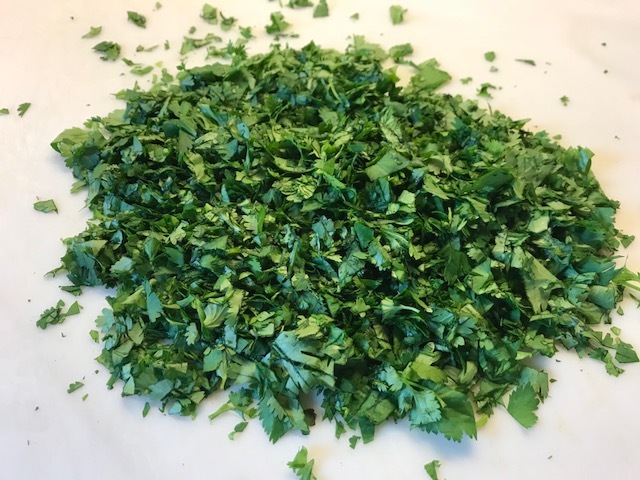 And finally, 1 bunch of cilantro is finely chopped. Really turns the mixture into a bright green goddess concoction. When I am not serving this to guests, I usually chop up a jalapeno pepper and add it to the mix. In the end, the salad is basically guacamole with tuna! When making the salad, be sure to save the avocado seeds in case you have leftovers. The avocado seeds will help keep the avocado from turning dark. The salad will store well for 2-3 days in the refrigerator. 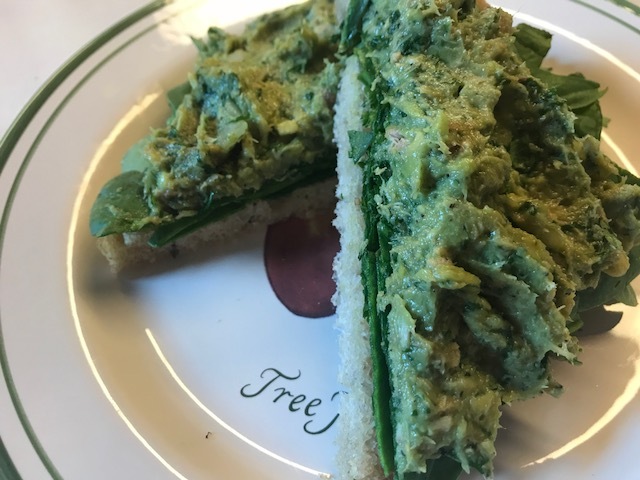 The salad can be served on a bed of greens, or on a hearty piece of bread with greens. Serve as a sandwich spread, or over a bed of greens. If serving over a bed of greens, drizzle with a little olive oil. 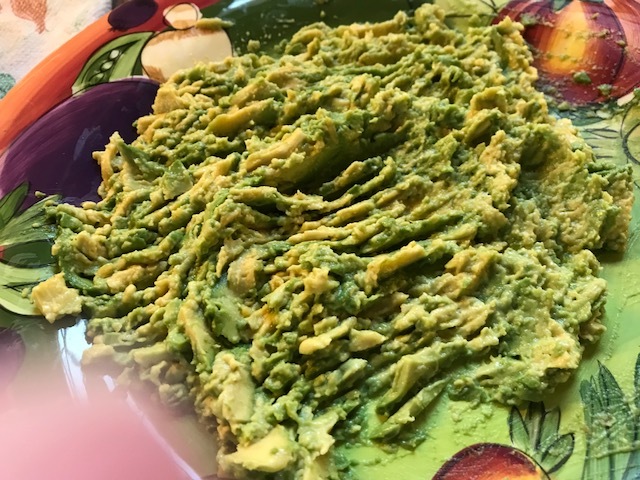 Save the avocado seeds to store with leftovers. 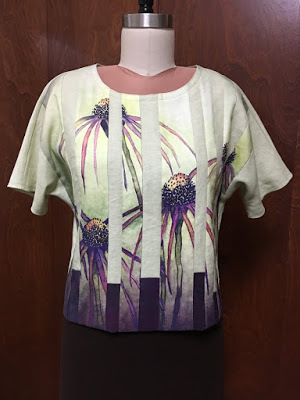 This is week 2 of the Woven Tee Challenge that Becky of Trial Balloons and I are doing. This week, we looked to the Orient for our inspiration, using vintage kimono fabrics as inspiration. Check out Becky's fabulous tee! You can read all about her inspiration, how she put the Kung Fu Bunny tee together that she made for me(a great story), and see her lovely tea recipe HERE. I decided to use the same pattern for the entire challenge. I think it's fun to see lots of possibilities with just 1 pattern. and since it's a free pattern, all the better! You can find the pattern HERE on the Fabric-store.com site. A friend of mine from Texas had a wonderful store in Galveston for years. At that time, she was able to get bundles of vintage/antique kimonos from Japan. She told me that when the bundles would arrive, it was a lot like Christmas as you never knew exactly what might be in the bundle. Of course the kimonos, but sometimes fabrics, and other clothing. The kimonos that were in good shape, she would sell, the others, she meticulously took apart and used the pieces for the most incredible table runners that she would make and then sell. She ultimately closed the store, and brought home all of the leftovers. In time, she realized that her years were growing short, and that she would never be able to use all that she had, so she began finding homes for her beloved fabrics and scraps. I was the lucky recipient of some wonderful pieces. 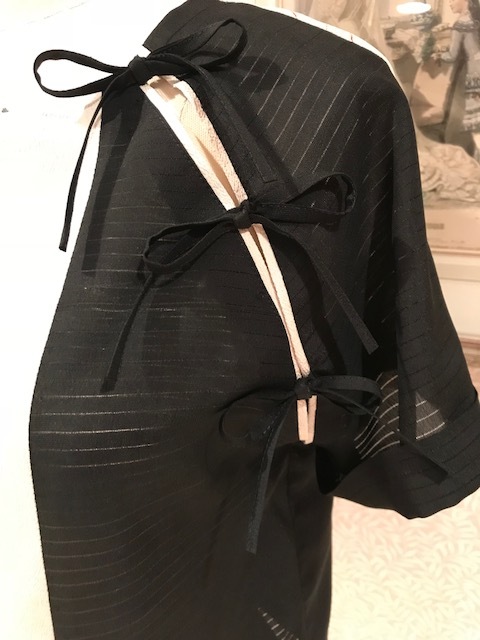 I had quite a bit of the black fabric, I think it must have been an entire kimono. The contrast strip was just a small piece, initially about twice as wide as what you see. 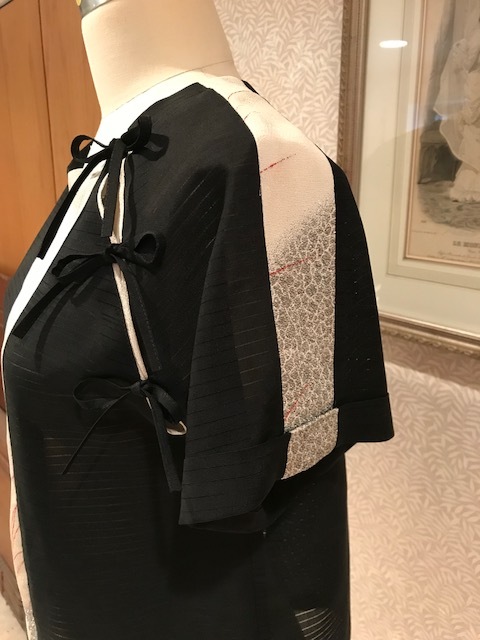 Since the kimono fabric is only 14" wide, and I'm not!! !, I had to piece the fabric, and decided to offset the contrast. 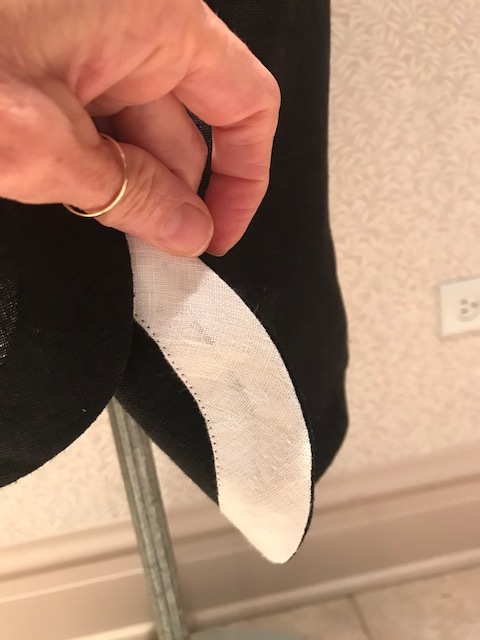 Rather than sew the raglan seam together on the left sleeve, I left it open, used a bit of the cream fabric from the contrast strip to accent the opening. I gave a nod to the beautiful Chinese knots with the ties. 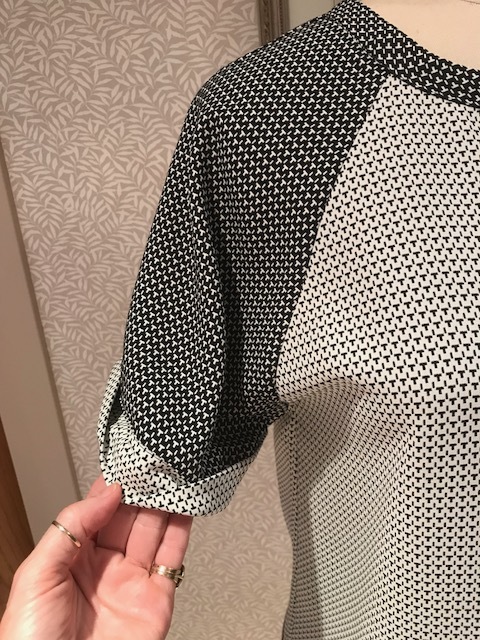 I used the leftover piece of the contrast strip on the sleeve. 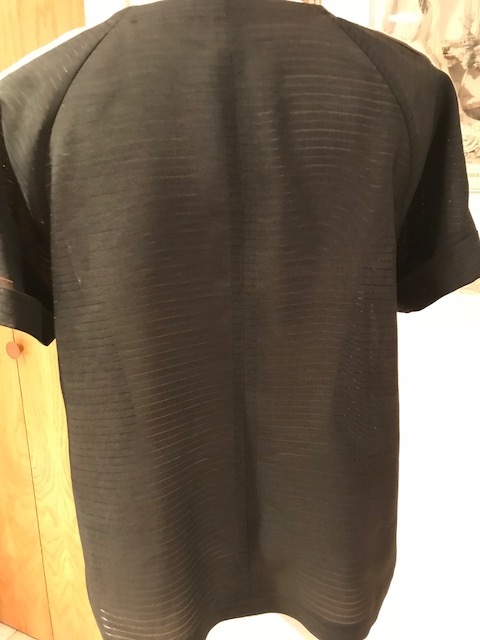 For the back, I was able to just put a seam down center back. 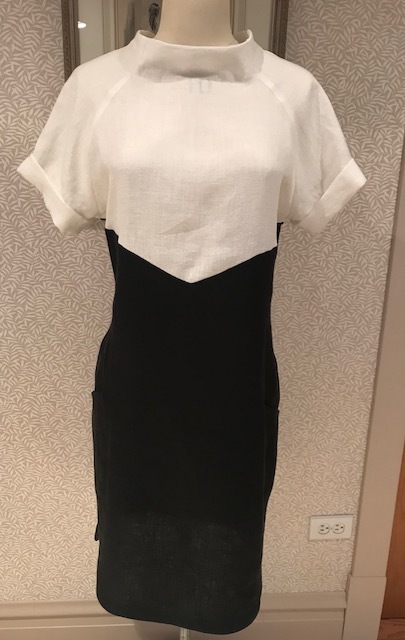 I had just a bit of the cream fabric leftover, so I folded it and did an insert on the right sleeve. Once again, the fabric is only 14" wide, so the sleeve needed to be pieced and this made it look like it was intentional. Now for my recipe. Like Becky, it's a drink, but rather than a hot tea drink, this one is perfect for a hot summer afternoon. 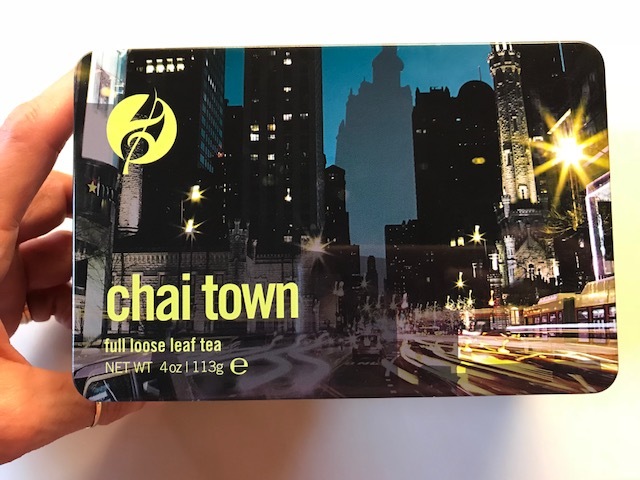 My favorite chai tea is from Adagio Teas. The name is of course a play on the slang term for Chicago, Chi Town. The tea comes in a lovely tin. Take a look at the lovely spices. Heavenly. 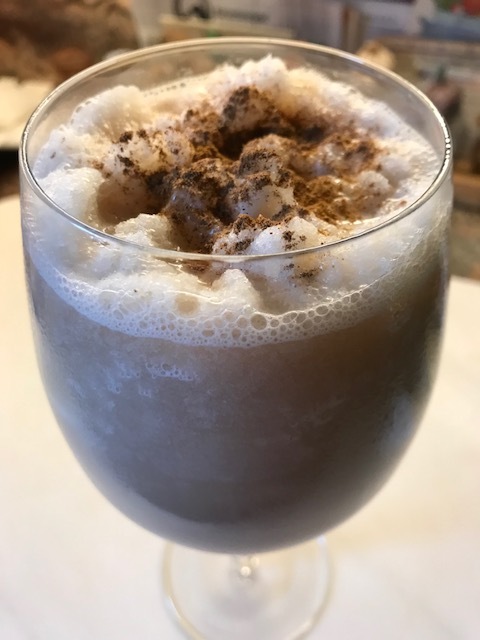 For my Frozen Summer Chai, I brew a cup of the chai tea, you'll need 1 cup. 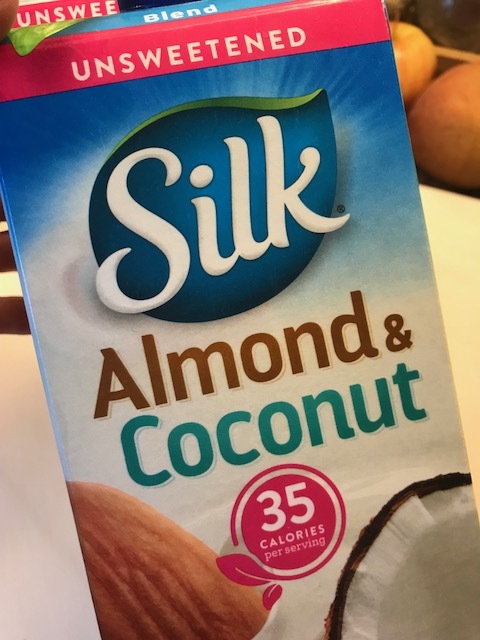 I mix the tea with 1/2 cup of Almond and Coconut milk. Place the mixture in a blender, and add sweetener of choice. Mine is stevia. Add a handful of ice, and blend. I serve the drink in a big wine goblet and sprinkle a bit of cinnamon on top. Guaranteed to cool you on the hottest of days :) And it will satisfy that late afternoon sweet tooth too! I hope that Becky and I have inspired you a bit. There are a number of vendors that come to the sewing expos with baskets of vintage kimono pieces. So pick up a few and make your own tee!